Latest UK inflation figures have been greeted with an extraordinary amount of fuss. A 0.1% decline in the rate at which prices are increasing is not, by itself, especially newsworthy. But of course the symbolism of hitting a 2% rate matters. It means the Bank of England’s inflation target has, for the first time since late 2009, been achieved. Leaving aside the politics around this arbitrary target, there are three things to note here. First, the cost of living crisis is not over. Prices are still rising much faster than wages and salaries. Inflation is 2%. Average earnings, however, have risen less than 1%. In other words, the real value of people’s wages and salaries is still falling. Most people are still becoming steadily worse off, as they have been for the last five years. The figures for December also miss out the sharp rises in household energy bills, which will feed into next month’s numbers. Second, the fall in inflation has little to do directly with the government’s actions. The biggest reason for the decline in the overall rate of inflation was a fall in the rate of price increases for food and drink, down from 2.8% to 1.9% over the year. But Britain is a huge importer of food, buying some £20bn more from abroad than it sells to the rest of the world. The prices we see in the shops are to a large extent determined by what is happening internationally. And with the pound rising in value over the last few months, the price of importing food has declined. Alongside that, after years of sharp increases, the prices of basic food commodities like wheat and sugar have fallen globally over the last year. Third, there’s an unusual danger lurking underneath this. Strip out food, drink, and energy prices from the headline inflation and you get a measure of what is often called “core” inflation. This excludes those items that are most affected by pretty contingent, day-to-day factors to try and get a sense of where the underlying economy is heading. Core inflation, currently, is 1.7%, having fallen from 1.9%. Now this is low. Over the last three decades, UK inflation has averaged 3.7%. But there’s a very particular danger associated with low inflation that appears in an economy which also has very high debts. Inflation chews away debts, over time. This is because a debt is repaid with money. Inflation reduces the value of money: as prices rise, less can be bought with each £1 held. This means it also reduces the real value of debt, since the debt must also be repaid in money. One way to get rid of debt is to allow inflation to eat away over time. The real burden of the debt is reduced as inflation eats into its real value. Britain’s debts from WW2 were partly shrunk by this process: along with fast growth, a relatively high rate of inflation – higher than the interest due – ensured the real burden of its astronomical debts were reduced over a few decades. However, if inflation is low, this effect does not apply. And if prices in general are falling, the real burden of debt will worsen. Worsening real indebtedness, in turn, hauls the rest of the economy backwards. A process of debt deflation can set in train, with collapsing activity leading to a further decline in prices, worsening the real burden of debt and so dragging the economy down still more. We’re still some distance from this vicious circle. But the UK is very, very heavily indebted – perhaps the most indebted large developed economy in the world. This is not, as the Coalition insists, because of government debt, which is not particularly high. 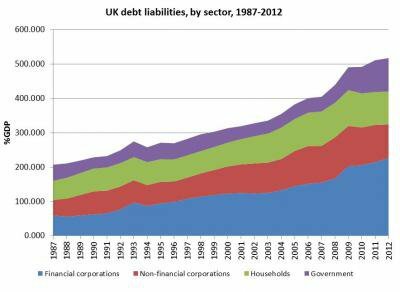 The UK’s debt burden lies principally with its private sector – with households, firms, and, critically, financial corporations. This burden is shown for each of those sectors of the economy on the graph below, as a share of GDP. It has risen precipitously in the last few decades, and has continued to rise after the crash. For households especially, the combination of both flat take-home pay and low inflation means their debt burden will prove very hard to shift. And as the last few years have amply demonstrated, attempts by households to repay their debt have simply dragged the economy backwards. It has only been over the last year, as households have run down their savings and started to rack up further debt that the whole economy has begun to move again. There’s a twist in this. The UK has very low inflation despite both exceptionally low interest rates, and – especially – the government’s £375bn quantitative easing (QE) programme. This, crudely, is akin to printing electronic money. Despite some excitable talk to the contrary, there is no direct relationship between expanding the amount of money sloshing around the system and increases in inflation. In the case of QE funds, the money has largely sat in banks’ own accounts instead of entering the wider economy. 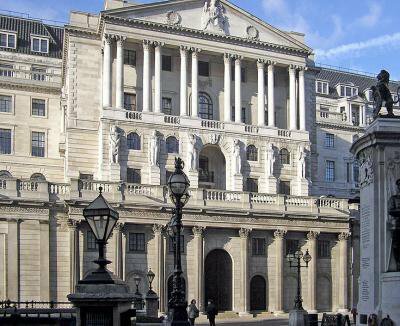 But a recent Bank of England paper estimated that, even so, QE has added 1.25 percentage points to the headline inflation rate. Strip that out and inflation would be exceptionally low – perhaps even negative. The QE programme is now drawing to a close. This has been one of the factors responsible for pushing up the value of the pound in recent months. As our debt-led recovery picks up, the risk of deflation will drop. More demand means, other things being equal, rising prices. But any break in that recovery runs the risk of pushing the whole economy dangerously close to a spiral of deflation and rising debts. The solution ultimately may well involve simply cancelling unpayable debts. Iceland has written off household debts equivalent to 12.4% of GDP since 2008, with the new government promising more to come. Could the same demand be raised here?